America still isn’t sure where her heart lies. When she’s with Maxon, she’s swept up in their new and breathless romance, and can’t dream of being with anyone else. But whenever she sees Aspen standing guard around the palace, and is overcome with memories of the life they planned to share. With the group narrowed down to the Elite, the other girls are even more determined to win Maxon over - and time is running out for America to decide. The selection is now down to six girls, with the competition to win prince Maxon's affections becoming more brutal. America initially entered for the monetary compensation for her struggling, middle to lower caste family and the decadent meals, but Maxon isn't at all how she imagined the prince would be. Her decision made all the more difficult by Aspen. Forgiving his hasty decision isn't the only issue that weighs on America's mind, it's the cruel and vindictive behavior of some of the Selection, her feelings for Maxon, and discovering the truth on how the young country of illéa was founded. The rebel groups are attacking with greater resources, more often. But when America encounters one of the rebel groups, questions are raised as to what they are really fighting for. America is conflicted, with only a handful of girls left, she is struggling to find her role and whether or not she is cut out for life as a royal. Keeping Maxon at arms length seems to drive him into the arms of the other contestants. It pains America more than she is willing to admit. When one girl is caught in a compromising position with a guard, it is only the beginning of a journey of disappointment for America. The fierce competition, her feelings torn between Maxon and Aspen, and the clear divides in society. But when America exposes the royal secrets, she knows that her time has come to leave. Is she ready or will Maxon let her go? 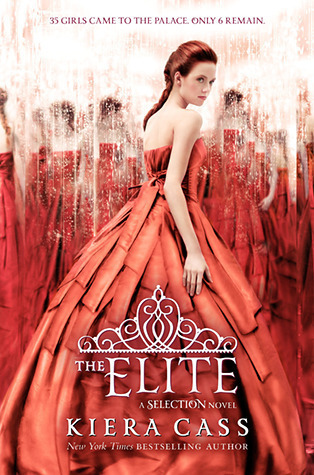 The Elite is the continuation of The Selection, with the storyline focusing on the competition between the girls and America's lingering decision on whether to commit to the potential life as a princess, or the wife of a guardsmen. America has lost her nerve and flitting between the two boys, she has lost her sense of identity. Where Maxon was the unlikely and surprising front runner in The Selection, neither Maxon or Aspen are worthy in The Elite, nor does America deserve either one. As far as the rebels are concerned, I was hoping that we would be introduced to their cause and how they are involved within the series... But nothing evolved beyond storming the castle. They seem as though they are merely scenery in a twisted love story of sorts. I still can't class the series as dystopian, rather not much more than romance. I'll be interested to read the synopsis for the third, and I believe final book in the series. I suspect it'll be little more than Maxon choosing a bride, and America stringing along both boys. Okay so I really liked the Selection but for some I've been putting this off and I have no idea why. Should I read it ASAP or wait until the third book comes out? Hey K, and thanks for stopping by. I'd get it out of the way sooner, rather than later, so that you can enjoy the last book. The great thing about 'The Elite', is that it provided little explanations here and there, to jog your memory about what happened in the first book. No doubt 'The One' will do the same. But 'The Elite' is just a filler with middle book syndrome.